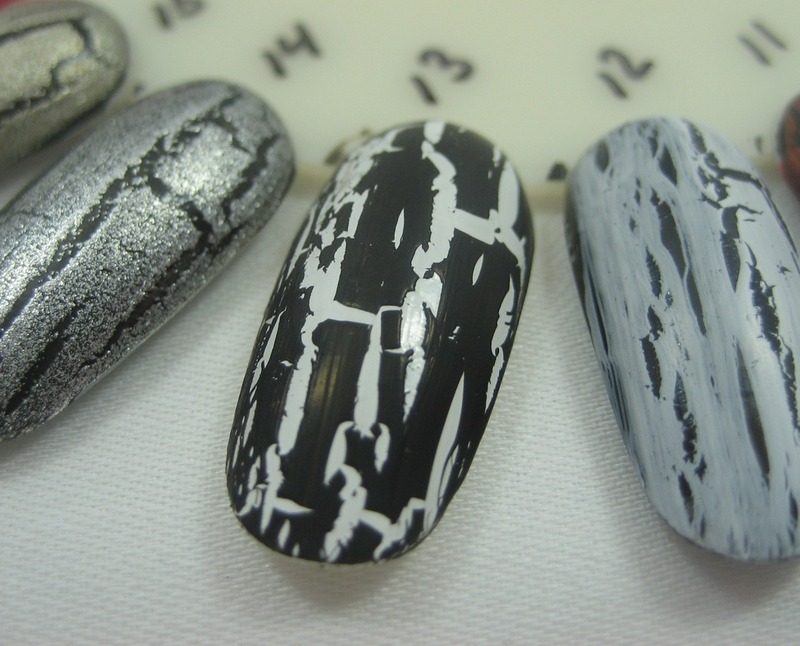 For today's Nail Wheel Wednesday, I am skipping way ahead in the alphabetical/numerical order to share some crack, as I know crack's popularity won't last forever, and it'll be a while before it comes back around as a hot new thing. I'm slightly chagrined that this is nowhere near all my crack; I just haven't gotten around to swatching the other ones on wheels yet. I admit it; I have a crack problem. What about you—like it, over it, never cared for it in the first place? 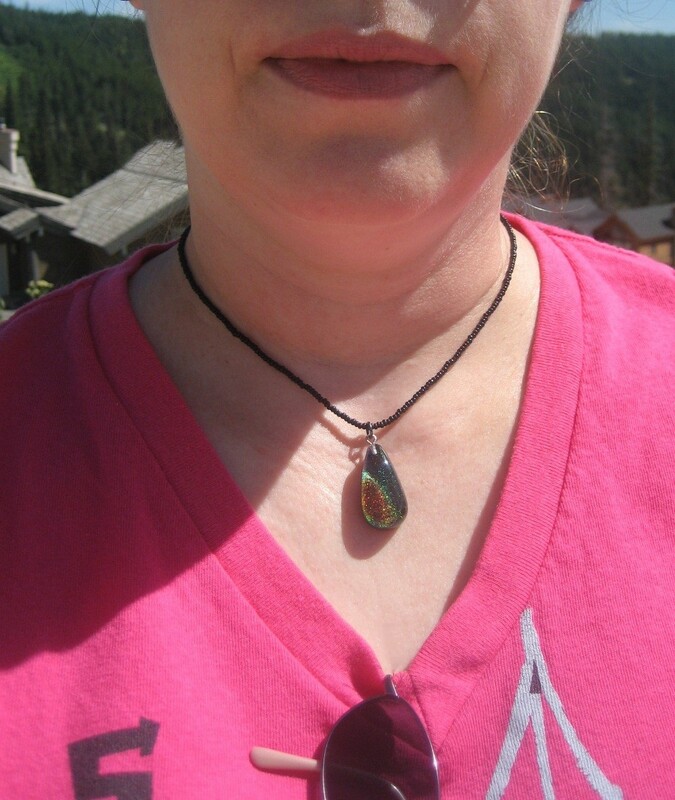 A few weeks back, Cara from workshop760 asked if I'd like to review one of the pendants she makes. I've turned down a request from a jewelry company before since I didn't think it had much to do with the subject matter I try to focus on here, but this was different—Cara's jewelry is made with nail polish, so I said yes, of course! 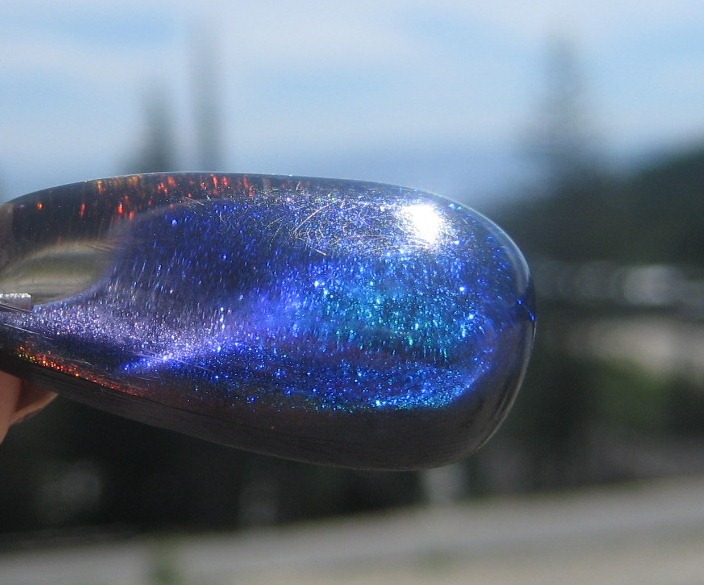 She asked me about my favorite color of polish and what size pendant I prefer, and a just little while after that a package arrived from her. 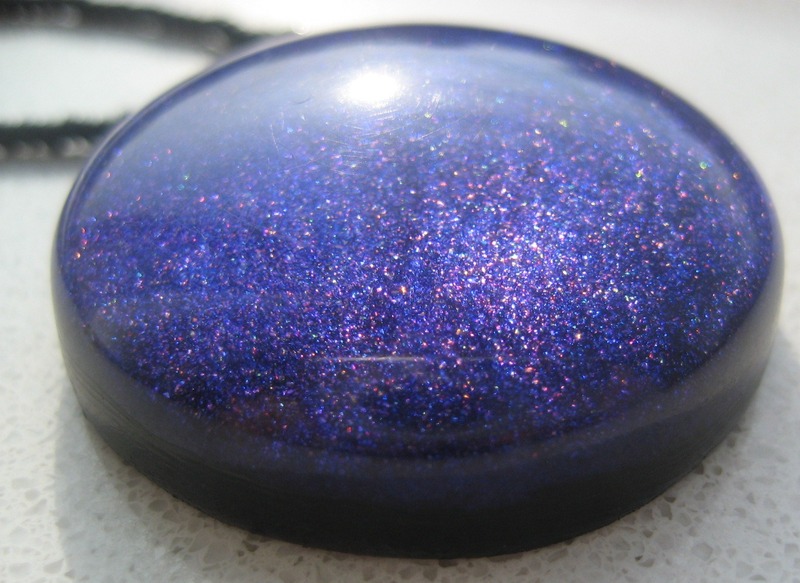 I had said "purple (followed by blue ...)" for my favorite color, and the round pendant made with Color Club Total Mystery that Cara sent fits the bill perfectly, as it's several shades of purple and blue all together. 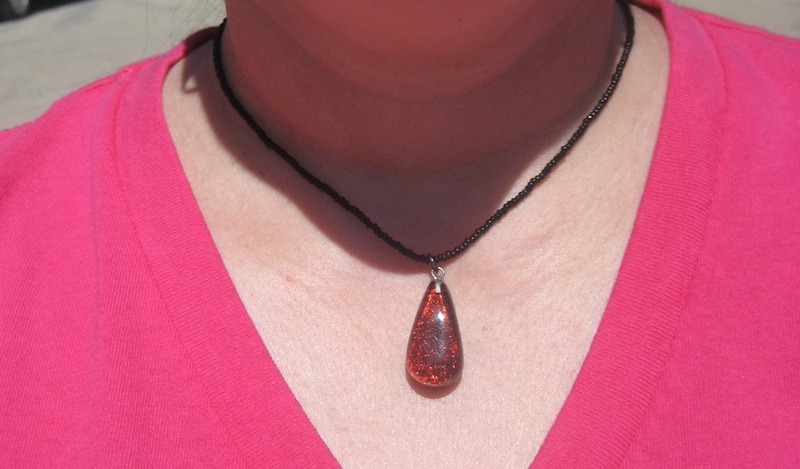 This round pendant came on a black beaded necklace (Cara makes those, too!) with what Googling tells me is a toggle clasp. 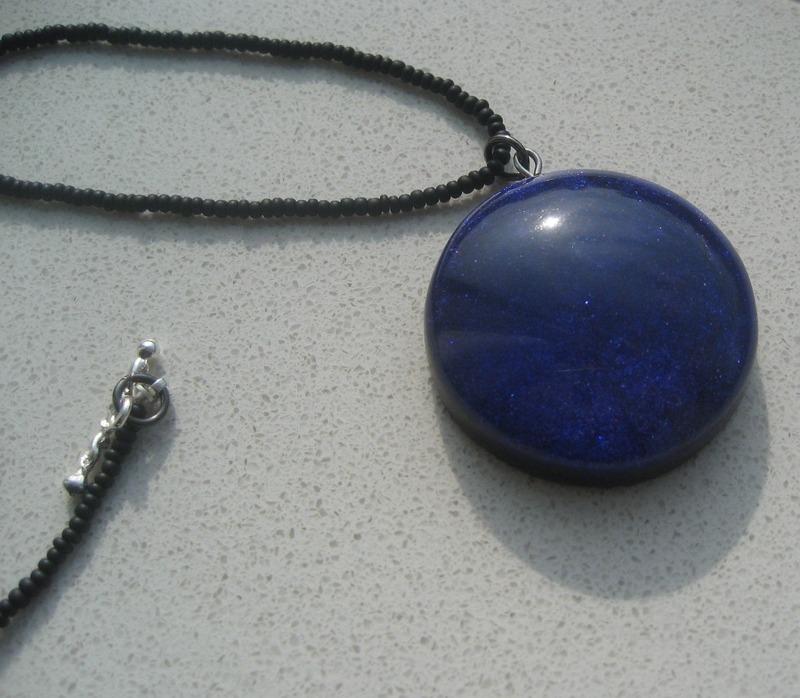 I unfortunately didn't manage to get any photos of me wearing this pendant, partly because I haven't developed good jewelry photo skills but mostly because I was very distracted by the suprise in Cara's package: a second pendant, this one made with the famous Clarins 230! 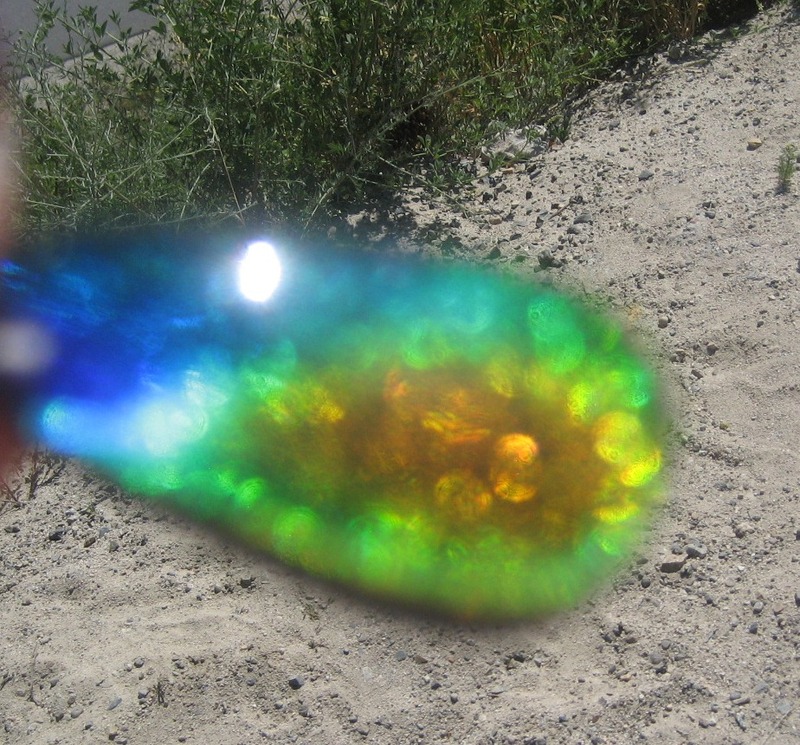 Even in the indirect indoor light of the room where I first set eyes on it, this one glowed with a whole range of colors, from blue through green to orange. In one of these taking it off to play incidents, I discovered that the black part on the back of the pendant didn't get along with my sunscreen. 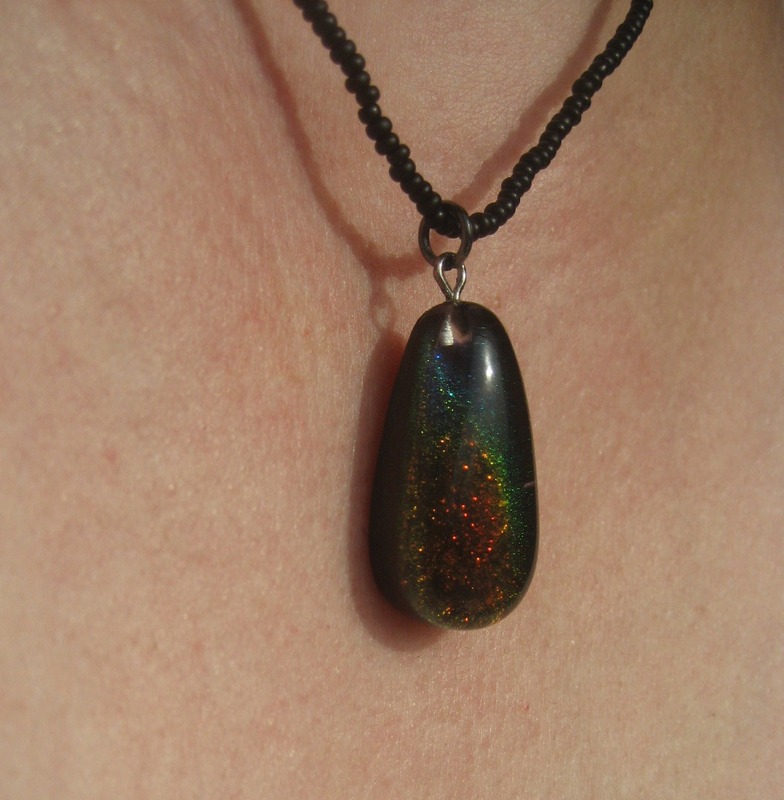 It felt a little gummy, like the chemicals in the sunscreen were reacting with the resin in the pendant, so I washed it with mild soap and rinsed and dried it and it's fine now. 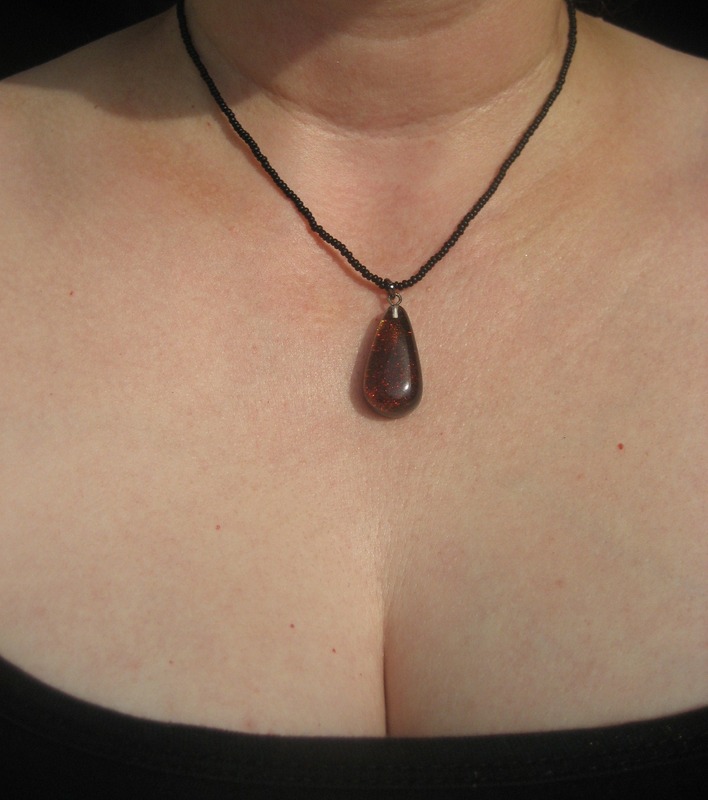 I used a different sunscreen after that when I wore these pendants and haven't had the problem again. 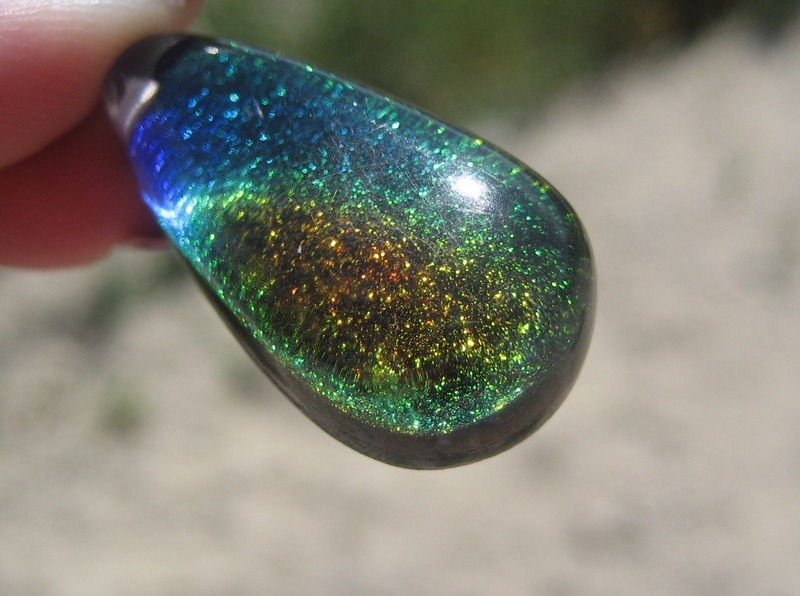 These pendants are my first nail polish jewelry but won't be my last. I've got my eye on a few things in Cara's shop, actually. 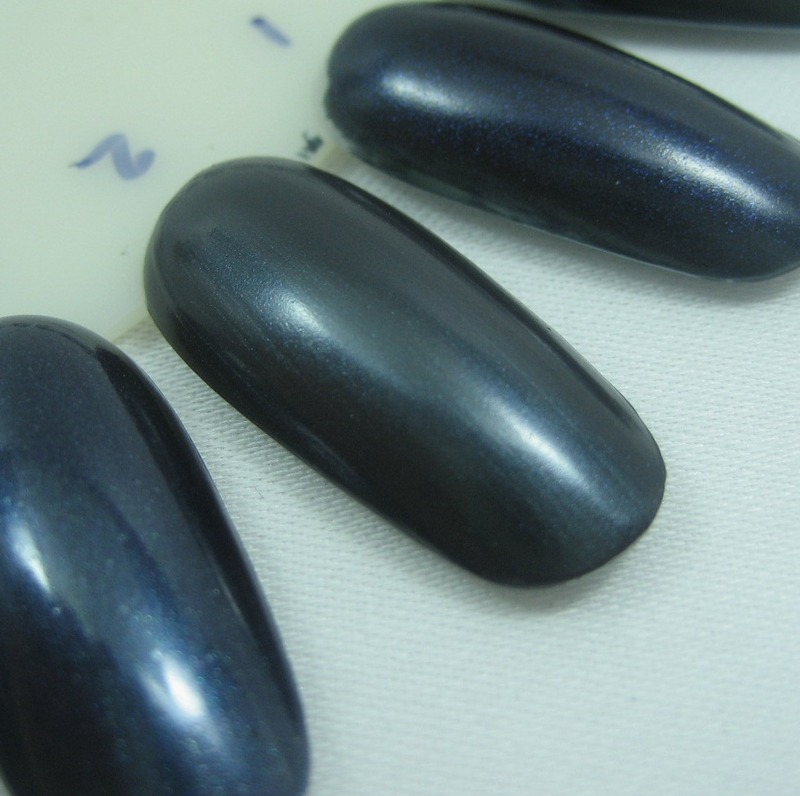 Looking at her stock on hand right now, the pieces are priced from $18 to $55 depending on the size and polish used; she has a lot of shapes to choose from and takes requests for custom items, too. The products in this entry were provided to me free for review purposes. The content of the entry was not dictated by the provider, and the products are mine to keep. Sorry, I didn't mean to be gone from here for three days. I know you're all used to my weekend posting being sporadic, but there should have been something on Friday. I was planning to do that entry in Maryland that day, during a gap in my schedule between finishing up a business meeting and getting together with some friends for dinner. That would have worked fine except I didn't realize how much time I'd need to spend that afternoon researching and pondering my options for leaving town to avoid Hurricane Irene. I'd originally planned to stay over the weekend so I could spend some time with a friend from New Jersey but instead ended up changing my flight to get home well before Irene showed up in the area. I did still get to have dinner with my friends Friday night, so that was good. Anyway, I am back now. 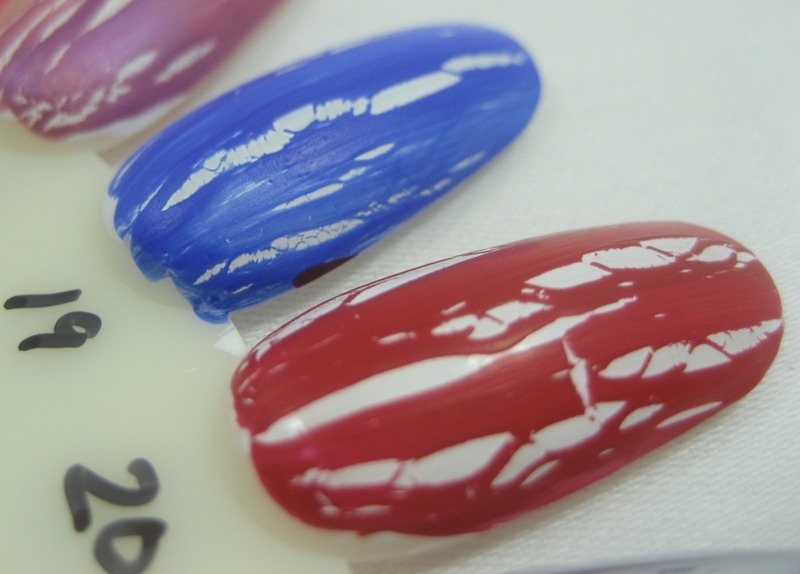 Today's feature is a recent mani inspired by all the jelly sandwich looks currently showing up on the MUA nail board and other places in the nailosphere. 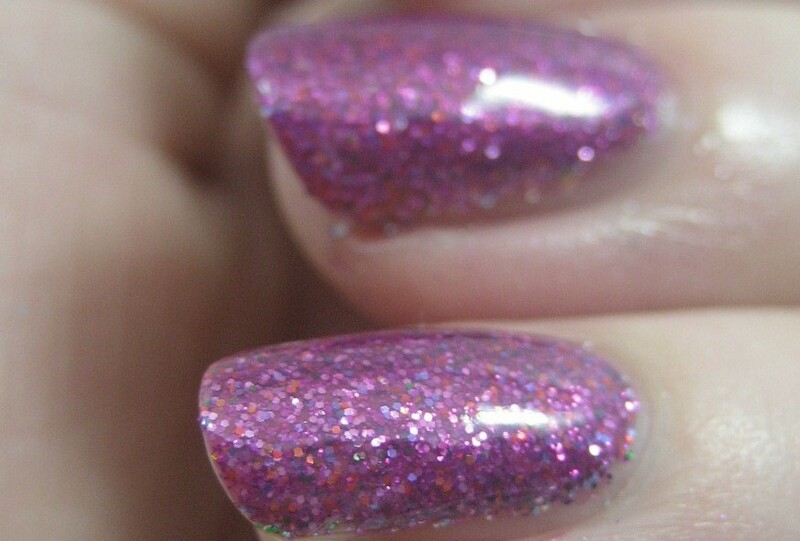 A jelly sandwich is glitter polish (the sandwich filling) layered in between coats of a jelly/sorbet (the bread). 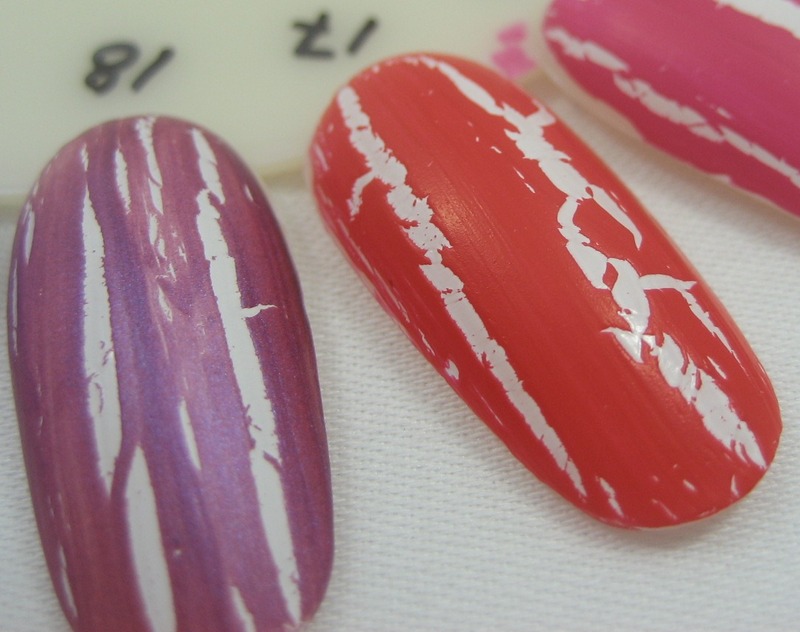 Instead of doing exactly that, I did the candy mani variation (which I think I first saw on Nailderella, though it could have been on one of the sites she links), where a less sheer polish is the bottom slice of "bread" and the jelly is the top slice. I applied my treatment and base coats, then two coats of Sally Hansen Complete Salon Chocolatte, 2 coats of OPI Show It and Glow It, 2 coats of OPI Houston We Have a Purple, and finally one layer of top coat. Did I absolutely need that many layers? Probably not, but I liked the result. This wore really well; I put it the Sunday before I left for my Idaho vacation, wore it through a week of work and packing for the trip, and it was still going strong nine days later. 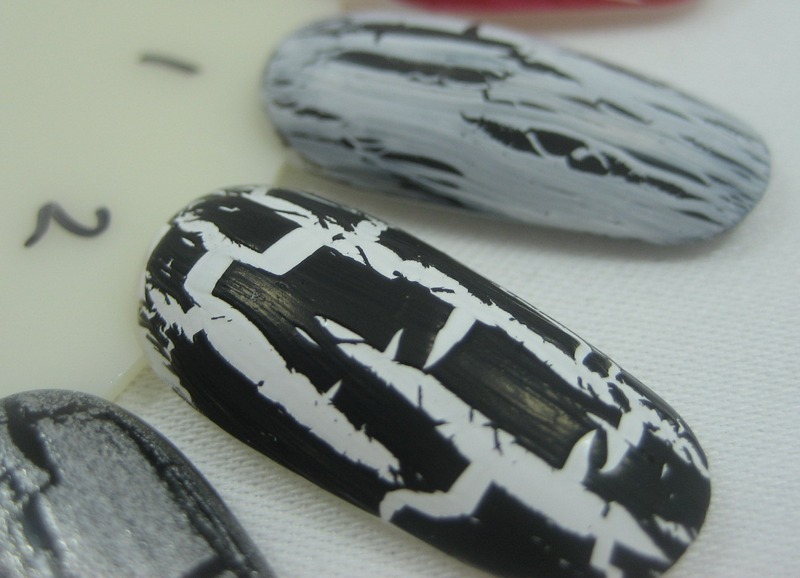 I did have some tip wear and a chip on one of my thumbs (I keep saying I'm going to stop using my thumbnails as tools and then I keep right on doing it). 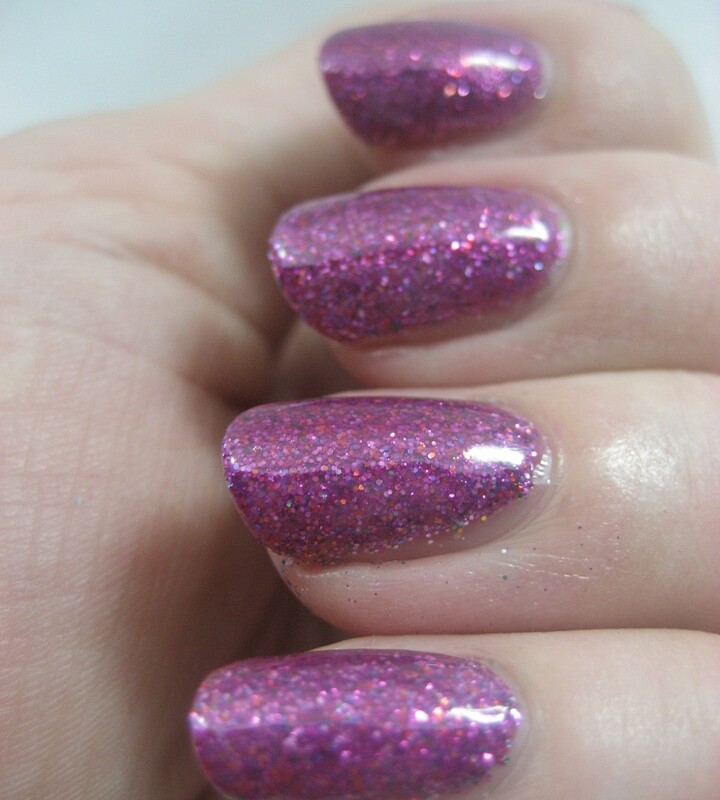 I liked it this so much I tried a variation on my toes, with Nicole by OPI Give Me the First Dance (1 coat), Rescue Beauty Lounge Frugalista (3 coats), and Zoya Vegas Freeze (2 coats). 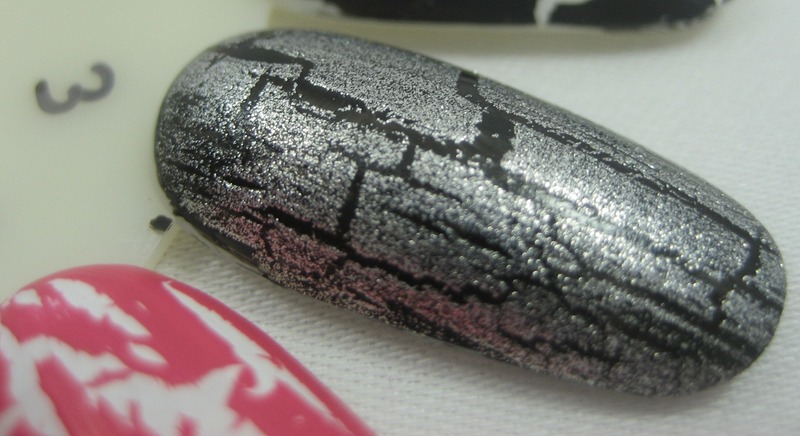 That was less successful; I think the base was too blingy and the Zoya too sheer to give the proper squishy effect. It's still pretty and silvery, though, so I'm leaving it on. I didn't manage to get a good photo of it, but will share the one I took of my hotel carpet, which I found quite soothing to look at while I was stressing out about avoiding the hurricane. 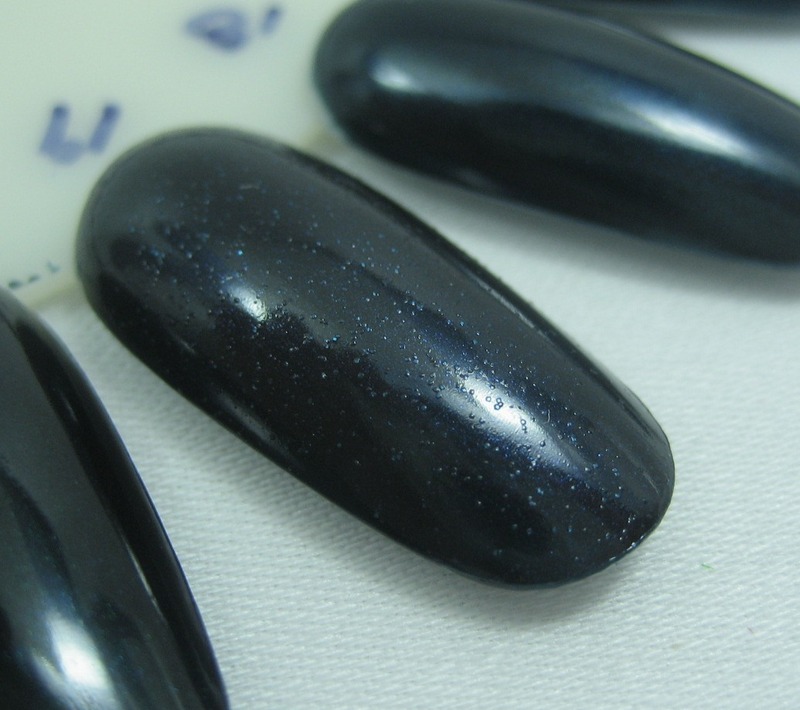 Unfortunately, this sandwich experiment has made me want to go find the OPI sorbets that I passed on. 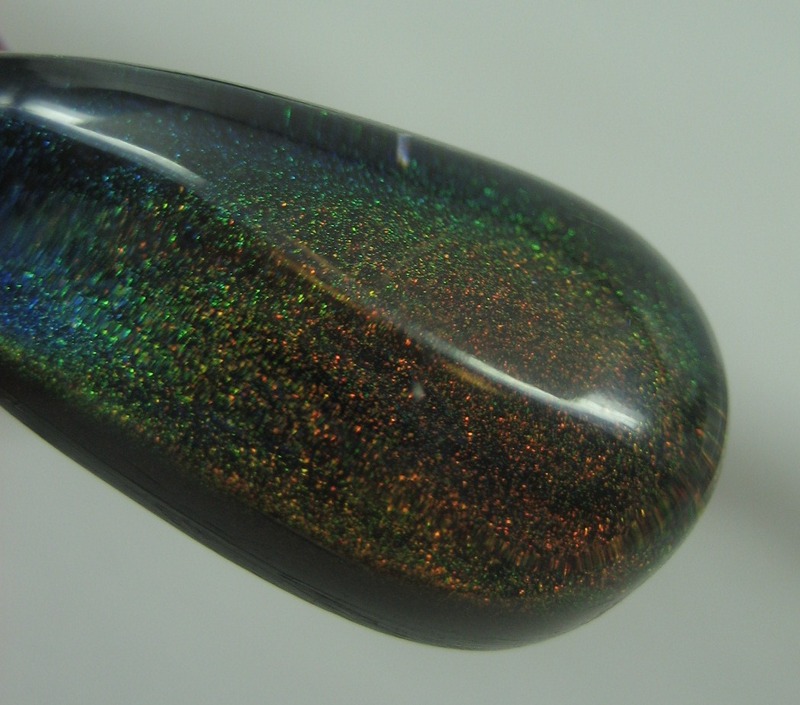 Perhaps I can distract myself from that urge with something shiny. 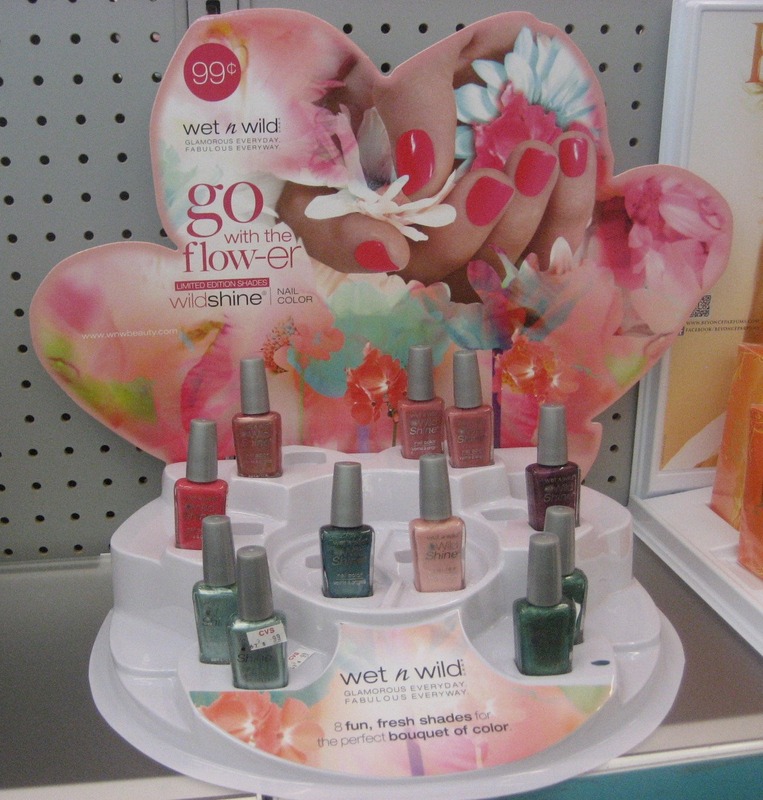 I'm not sure what's going on with Wet 'n' Wild; I only saw the Inked display at a couple stores early this summer, and now I've only seen Go with the Flow-er at one single CVS a few weeks ago. Based on things I've read online, this should have been out months ago. There were some empty spots in the display by the time I got there, but near as I can tell, there are eight colors in this collection: Tulip-git to Quit (bright warm pink), Right the Marigold-Round (brownish rose), Strike a Rose Vogue (mauvey rose), A Healthy Carnationship (light warm pink), Why Would I Lilac to You? (purple), Head in the Clouds (light teal), Save Water There's a Drought (teal), and Beat Around the Bush (green). I like the pinks/purples for blossoms and greens for stems theme, though I wish they'd included more variety in the greens—a bright grass green, for instance. That teal is so similar to a couple other Wild Shines that it seems like that slot should have been filled with something different. Crack is still going strong, as least as far as more brands putting out their versions. 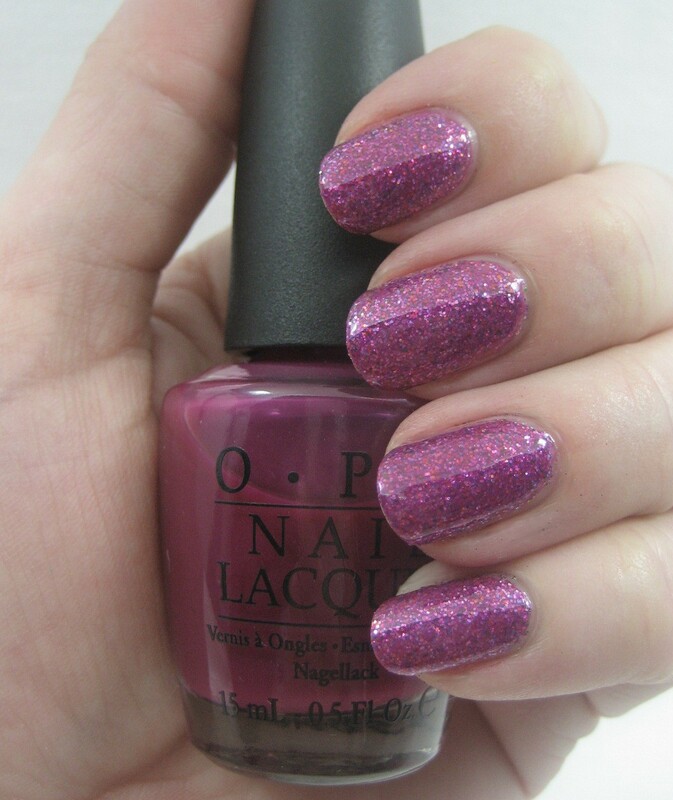 Nicole by OPI calls it Texture Coat. At Meijer, I've seen displays with four colors (Black Texture, Red Texture, Silver Texture, and Gold Texture), though I've seen swatches of other colors online (white and turquoise). One of my Walgreens had a crackapalooza display, with many, many colors from 2012 by Cherimoya (I guess they're betting on the crack fad being over by 2013). I was most intrigued by the muted colors here, some mauves and brownish pinks, as I've not seen crack in those hues before. These were cheap, too: US$2.99 for one, $5 for two. 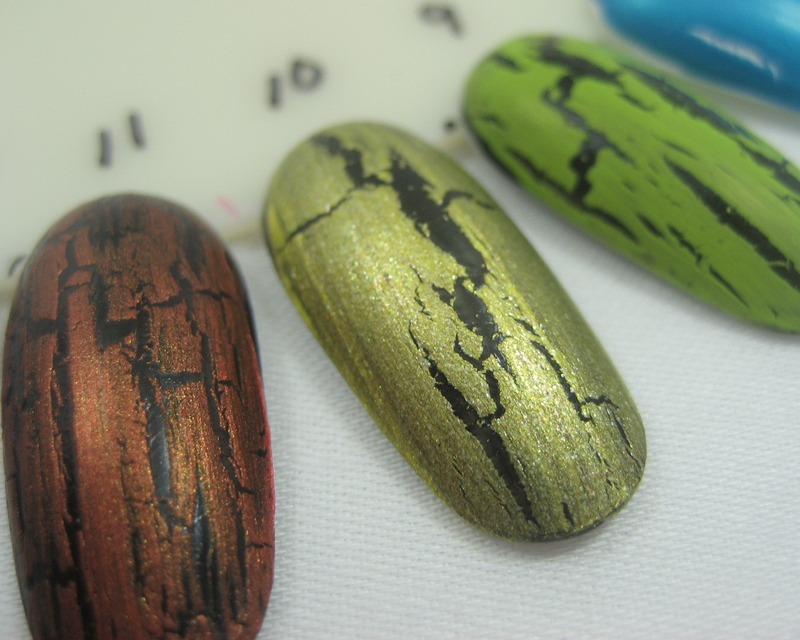 Sally also had new non-crack Finger Paints, the Fall Fashionista collection.There are nine colors in that one: Stunning Stilettos (gray), Haute Taupe (light brown), Military Green (sage), Vintage Velvet (blue green), Catwalk Queen (dirty yellow), Purple Pinstripe (warm purple), Raspberry Tafetta (reddish plum), Cordur-Orange (orange) and To-Teally Chic (turquoise blue). 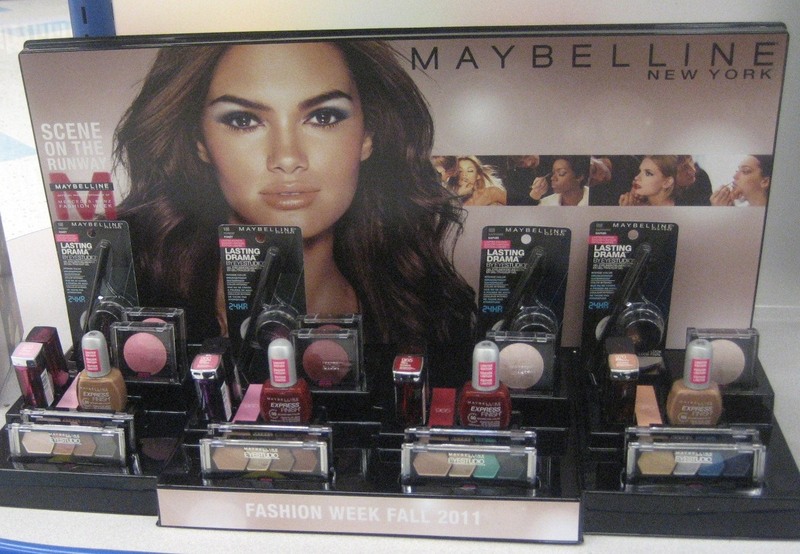 My Rite Aid just put out the Maybelline fall displays. 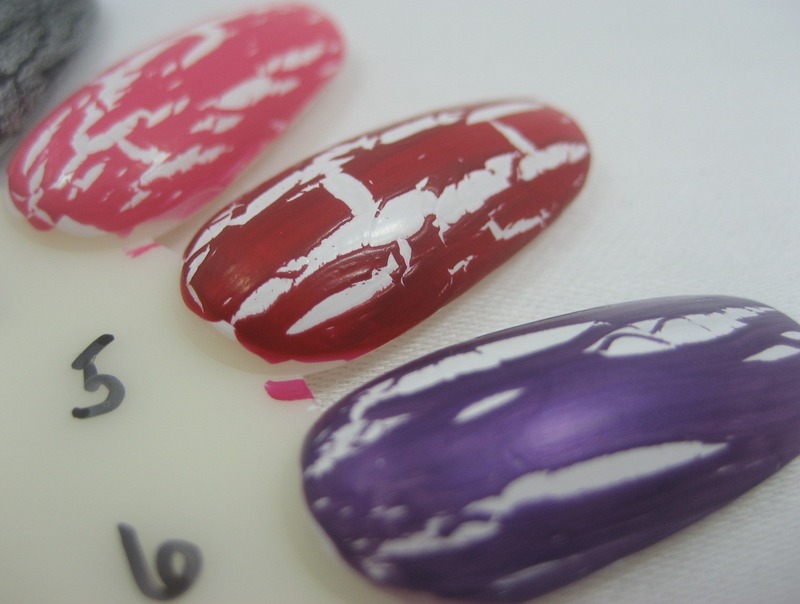 The makeup one has two polish colors in it: Natural Beauty (camel) and Sultry Siren (red). 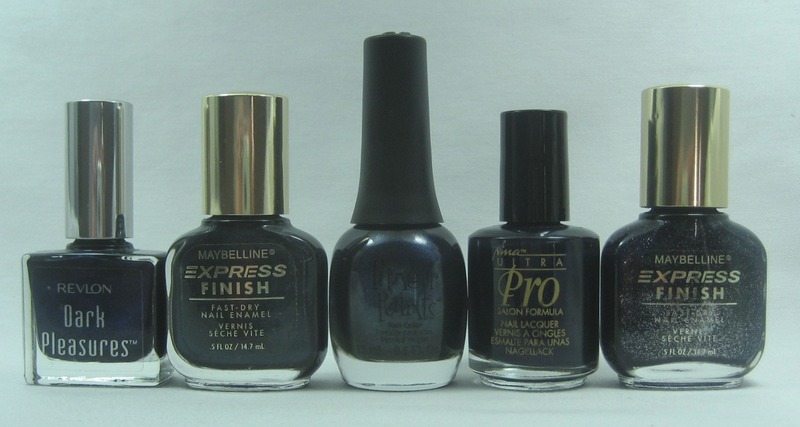 The nail polish one has six colors: Mauve Accents (mauve), Cool Couture (grey), Be Scene in Green (blue green), Notorious Navy (dark blue), Gold Accessory (gold), and Purple Trend (dark plum). 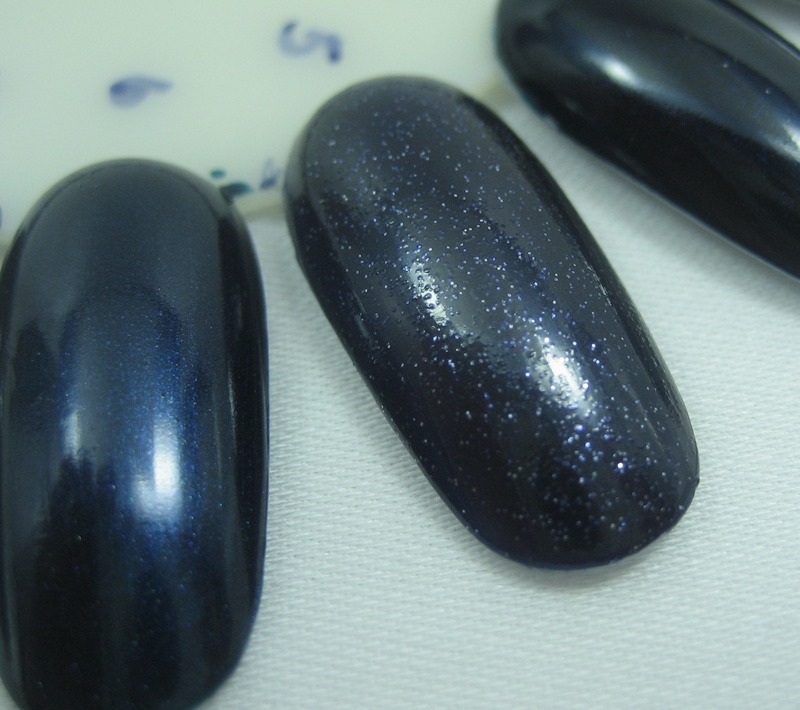 The plum and the grey both have a very intriguing shimmer; I'll be interested to see if it shows on the nail. 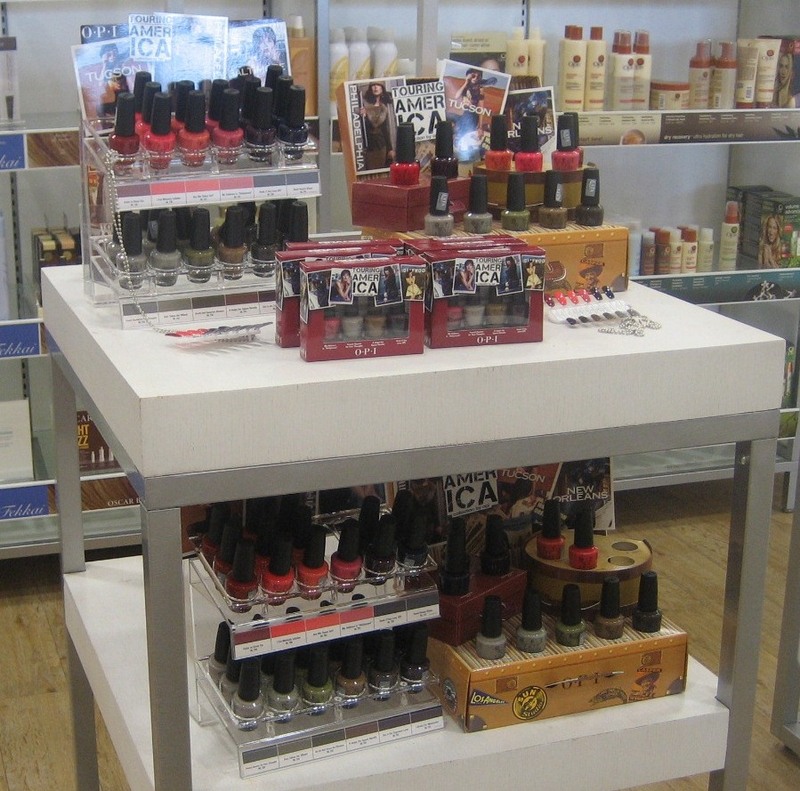 I haven't seen all of Essie fall yet, but Walgreens did have the 4-color retail display with Case Study, Carry On, Power Clutch, and Lady Like. 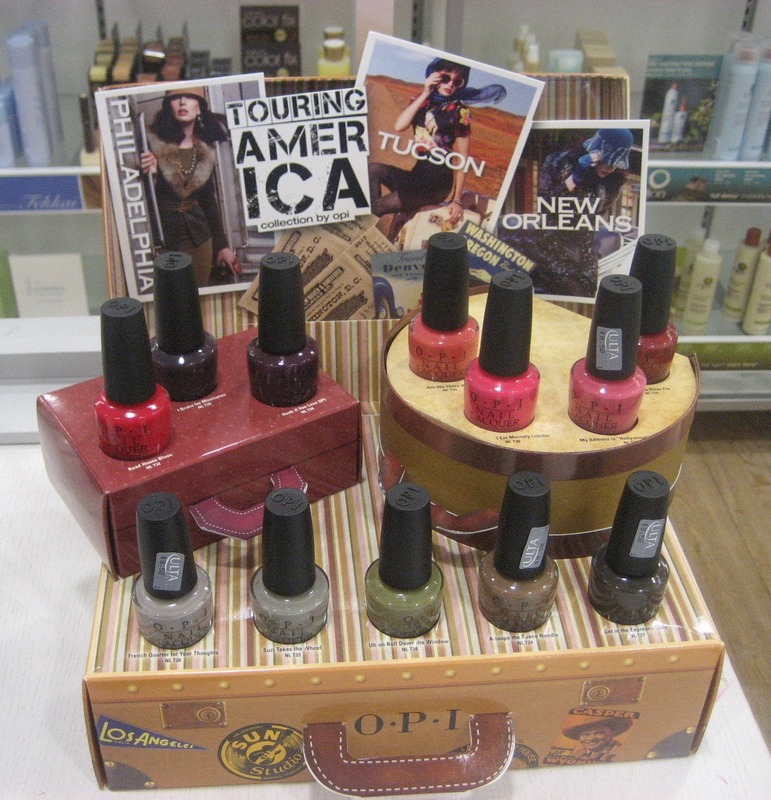 OPI's fall offering is Touring America, which I saw at Ulta. 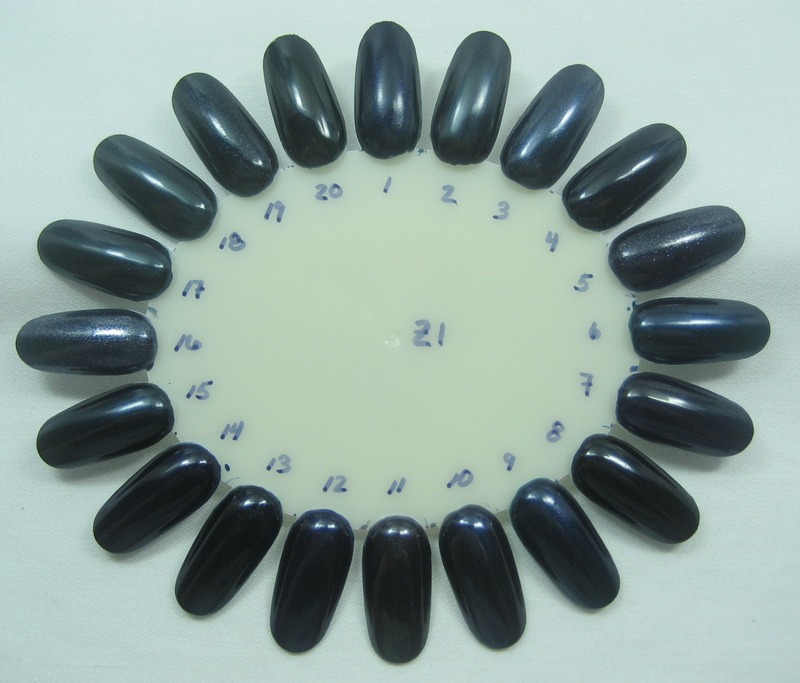 Twelve colors here: French Quarter for Your Thoughts (gray), Suzi Takes the Wheel (also gray), Uh-oh Roll Down the Window (olive), A-taupe the Space Needle (brown), Get in the Expresso Lane (dark brown), Road House Blues (dark blue), I Brake for Manicures (dark purple), Honk if You Love OPI (dark plum), Are We There Yet? (orange), I Eat Mainely Lobster (coral), My Address is “Hollywood” (warm pink), and Color to Diner For (red). I didn't notice until I was formatting the photos that there's a red that doesn't belong in one of the displays (bottom photo shows it best). Halloween displays are starting to show up, too. 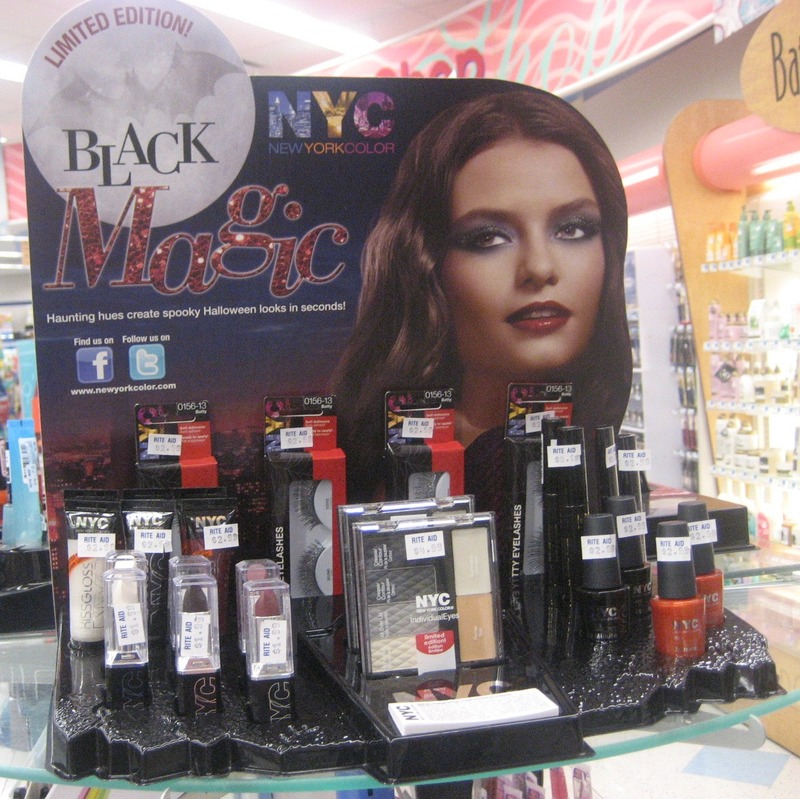 NYC has Black Magic, which includes two polishes among the rest of the makeup: Blackula and Pumpkin. I saw this at Rite Aid. 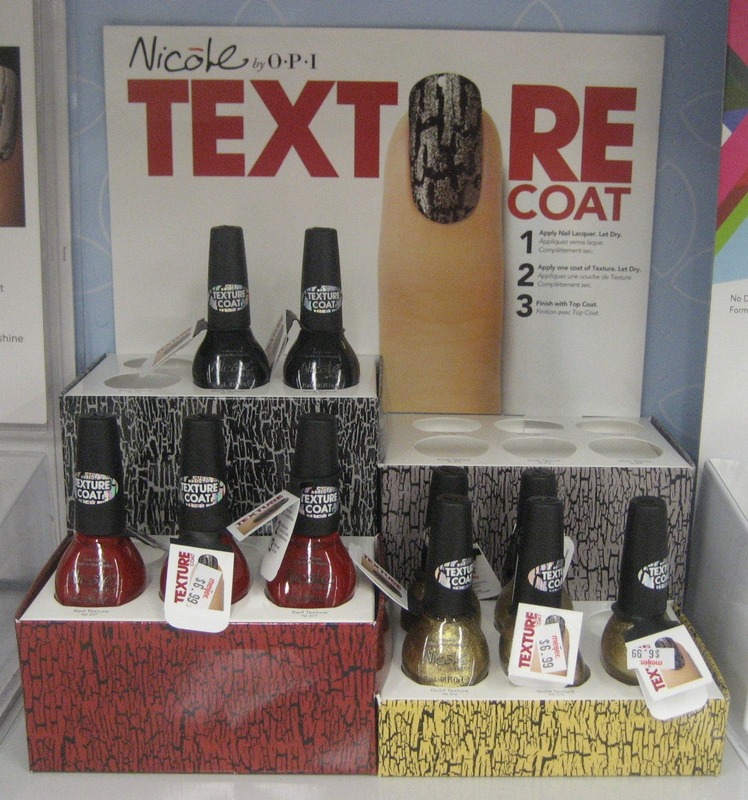 Sally Hansen has pulled some of the new Hard as Nails colors into a Halloween display: Black Heart, Rock Bottom, Die-Hard Fan, Steely Gaze, Limestone, and Tough Love. 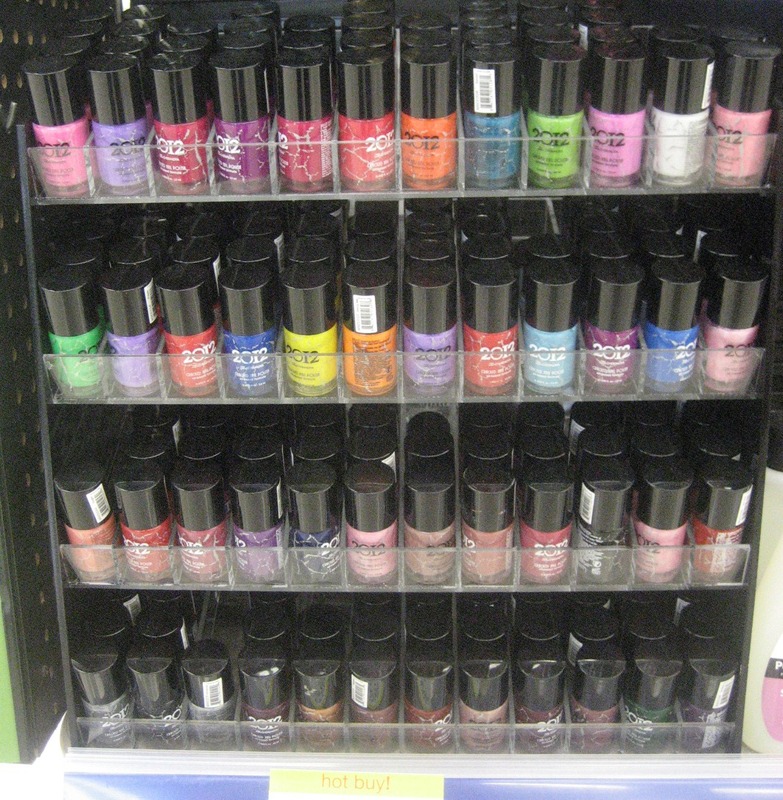 This display was at Walgreens, but the colors are core now, so you can get them lots of places. 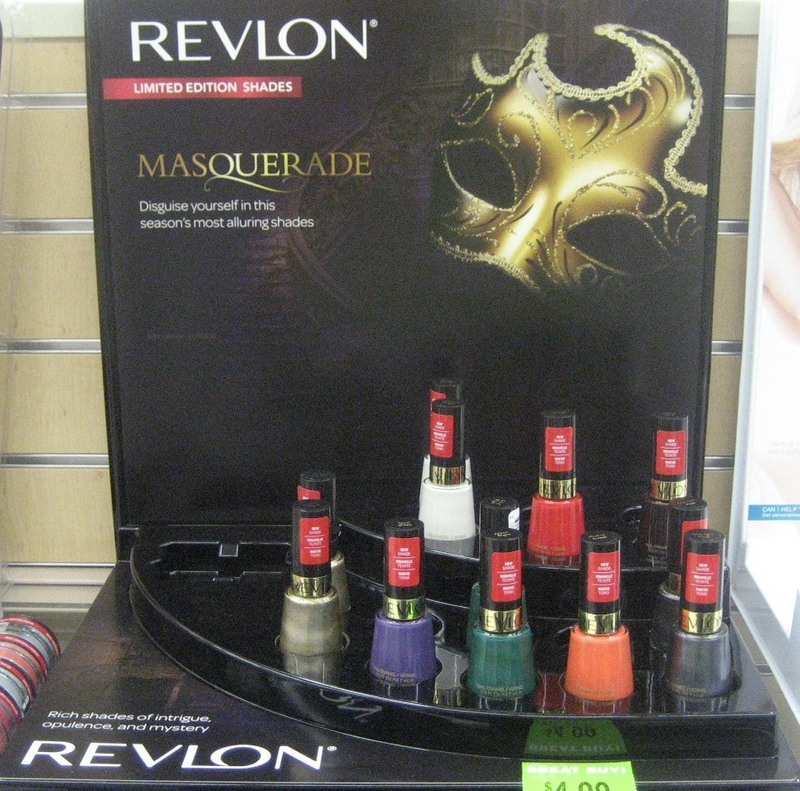 I'm not sure if the Revlon Masquerade display I saw at Walgreens is strictly for Halloween, but it sure looks the part. 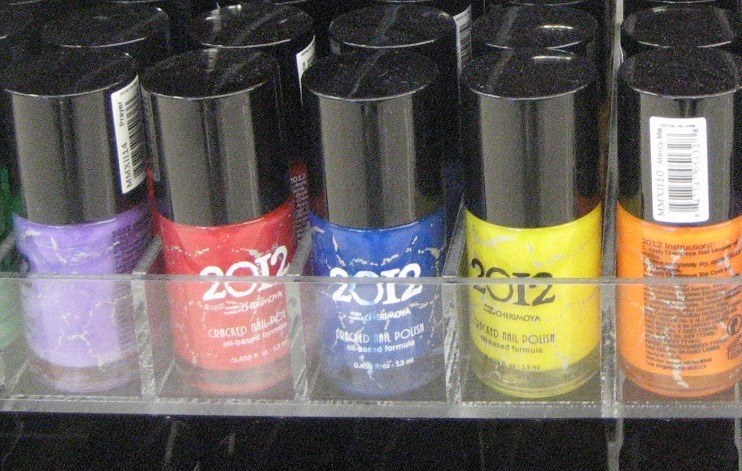 This display says "limited edition", but the bottles just say "new shade" so I don't know how long these will be around. Colors are: Golden Charm (gold), Royal Cloak (purple), Jaded Night (green), Alluring Amber (orange), Midnight Haze (grey), Phantom Angel (white), Devil's Candy (red), and Devil's Lure (very dark brown). You may notice not so many displays from Ulta this time, which is a result of me not spending nearly as much time there as usual. On the same trip where I saw Touring America, I saw the new bottles for the Ulta salon polishes.Now, instead of tallish square bottles with narrow black caps, they're round bottles with wide silver caps. It hasn't been very long since they changed to the black capped bottles, so it seemed odd that they were changing again so soon. Then I looked more closely and saw what's probably the reason: the new bottles hold less, though they look to be about the same size. The round bottles hold .33 fl. oz. (10 ml), while the black capped ones were .40 fl. oz. (11.8 ml). That's not a huge change, but it's not like the price went down to match; in fact, the price went up, from $5 to $6 a bottle. 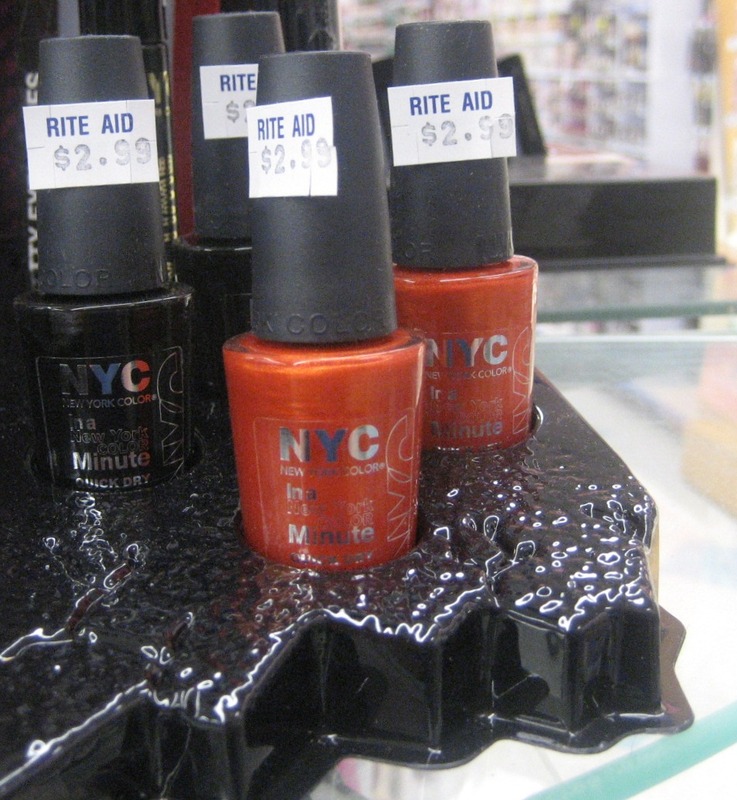 Per milliliter, that makes them slightly higher priced than OPI and Essie, which I think is a bit much. It even makes them more expensive per ml. than their Professional line, unless they raised the price on that, too—I didn't look. 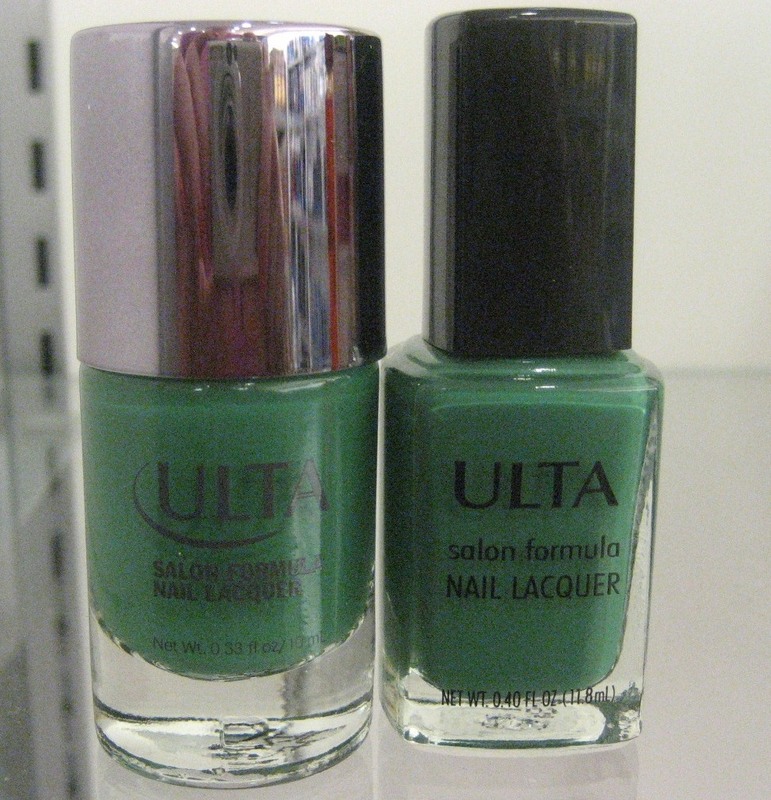 But the salon polish shenanigans are not why I'm mad at Ulta. What I'm really upset about are the changes they made to the Ulta rewards program offered in this part of the country, where they issue rewards four times a year based on my spending in the previous months. 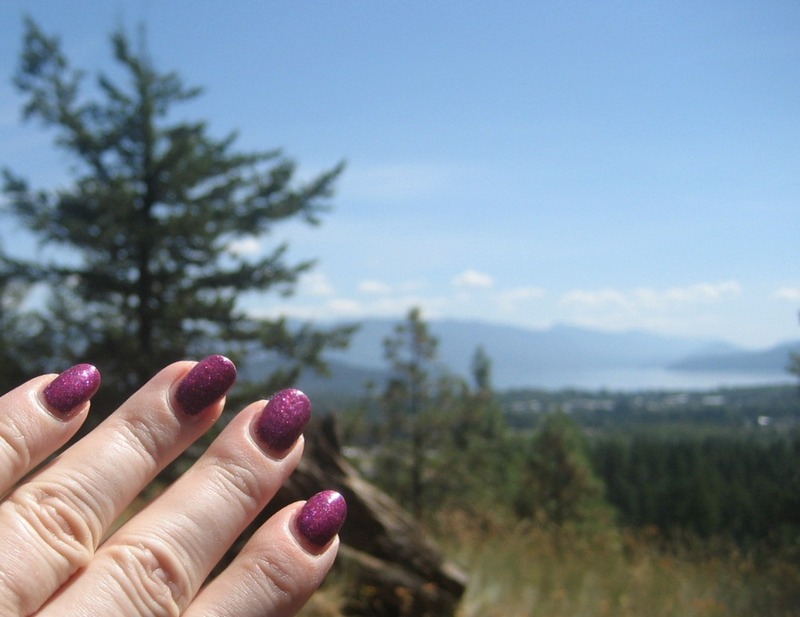 When I first joined up, a level 2 reward meant I could get any polish up to $8.50 for free, which meant more OPI and Essie for me. 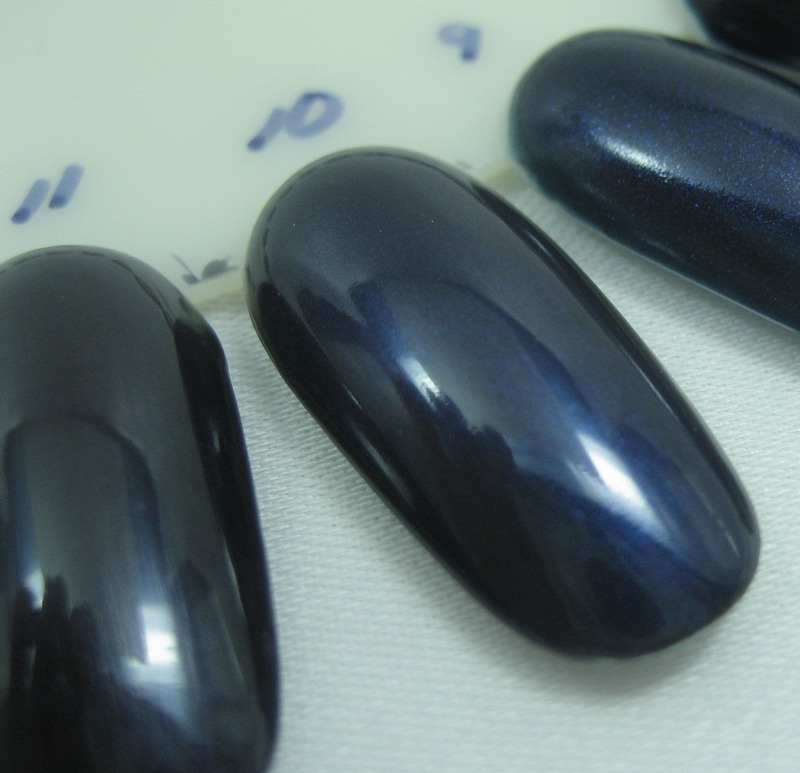 Last quarter, they changed it so those polishes were at level 3. I wasn't happy, but I understood—the economy is still not great and everyone's got to make sacrifices. 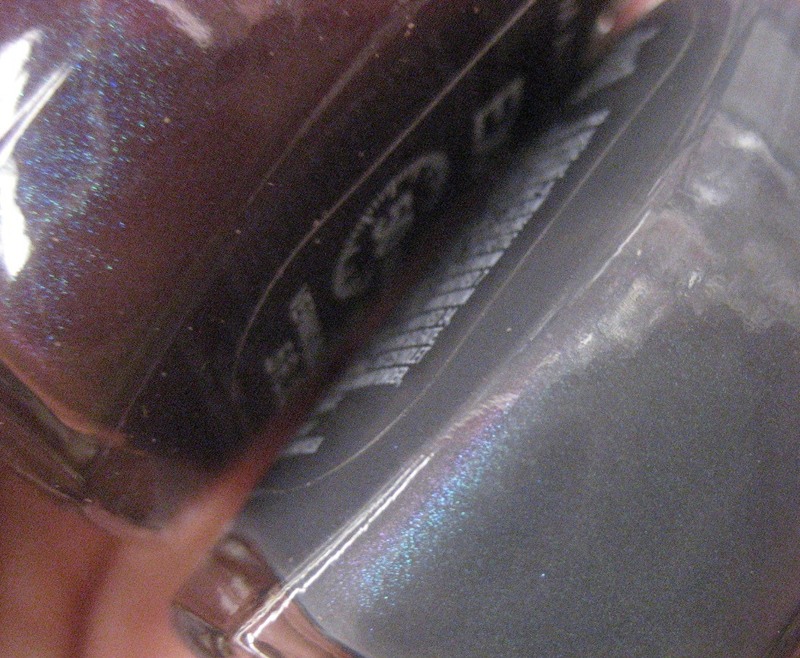 But this quarter, the only non-Ulta brand polish on the rewards list is Essie Ballet Slippers, which most serious polish heads either already have or don't want. I spent enough to get a level 11 this period, which I was planning to use for three of the fall OPIs, but now all I can get is an Essie I don't want and some of the new smaller Ulta salons. Color me not happy. I know Ulta is not obliged to cater to my narrow interests as a nail polish lover, and neither am I obliged to shop somewhere that doesn't value me as customer. 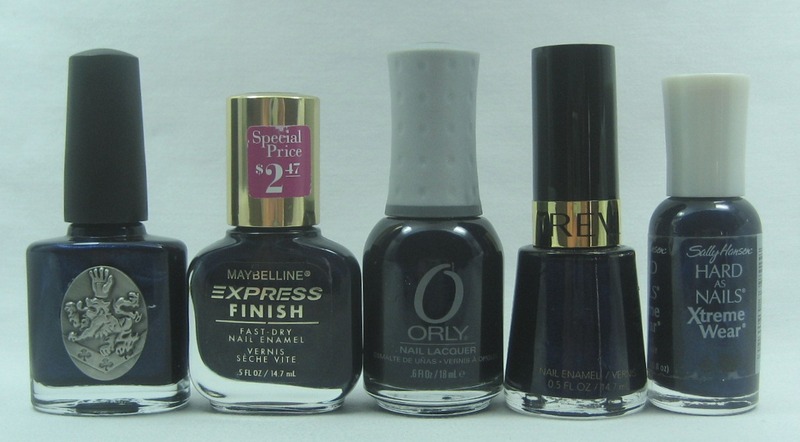 I'll still go and take photos and check the clearance section, but my days of dropping big bucks on nail polish there are done for now. 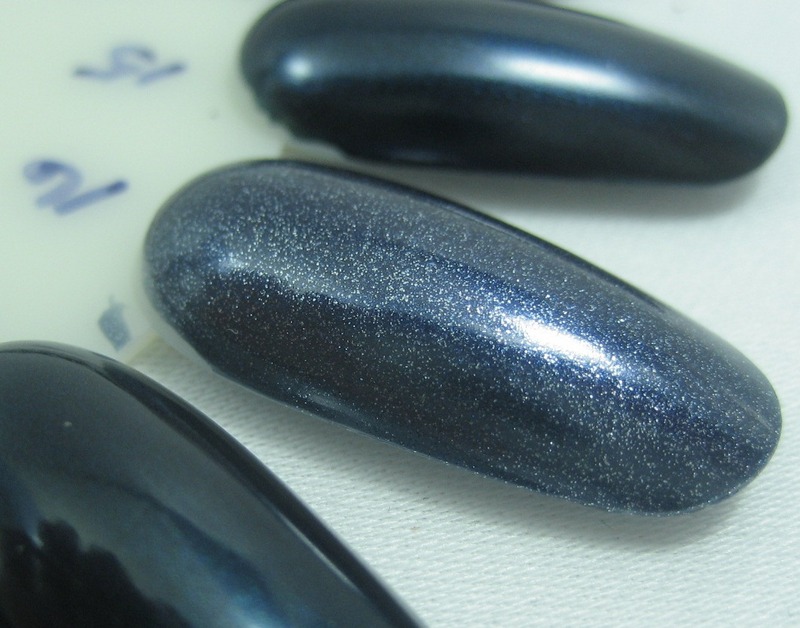 Some of these are so dark and the shimmer so subtle that they look like cremes. 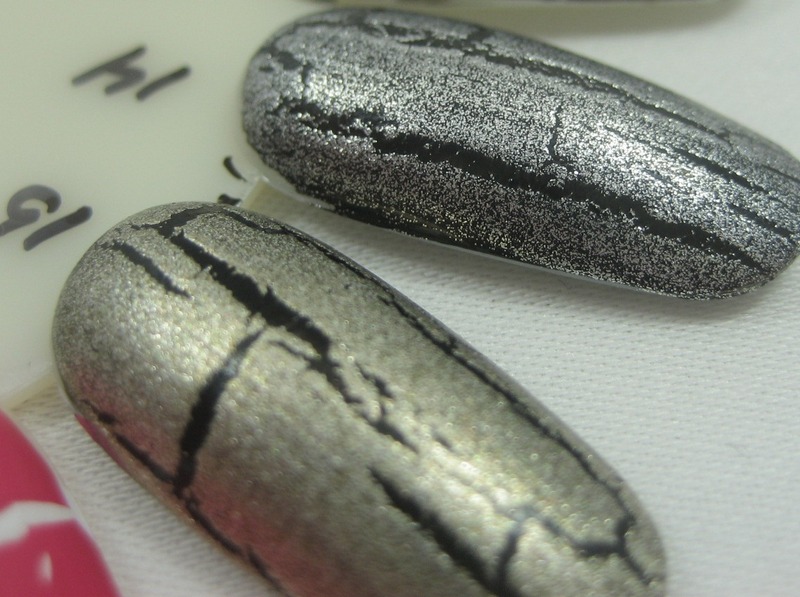 Some walk right up to the line between shimmer and glitter. I definitely do not need all these variations—perhaps I need to have De-Stash Saturday to go along with Nail Wheel Wednesday.